Fluid Temp – Because stable fluid temperatures lead to the most accurate test results we strictly control them using state of the art technology to insure a valid test run. Test Machine # – This is an internal reference/ID number that allows us to keep track of which machine was used for which test. Test Pressure – Our default the majority of tests are performed at 43.5 psi (2.99921942 bars) which is considered the industry standard for testing fuel injector flow. TBI/CIS are tested at different pressures. Also, a customer may specify a different pressure for their specialized application. Resistance – The coil resistance at the ambient temperature of the shop. We control the environment of the shop to keep readings accurate. Leak Test – All fuel injectors are checked for leaks at 10, 40 and 100 psi. Additionally this test is performed 3 times both before and after cleaning. The repetition is necessary to detect small, hard to find leaks. Spray pattern – We do a visual confirmation of how the fuel injector is actually atomizing the test fluid while it is running. It is given one of three grades: Good, Fair or Poor. We use an “X” to indicate the fuel injector was not functioning at all during the test. Static Flow – The fuel injector is held open and the volume of flow is measured in CCs/minute. Pulsed Flow – Your fuel injectors are pulsed off and on to simulate normal use. 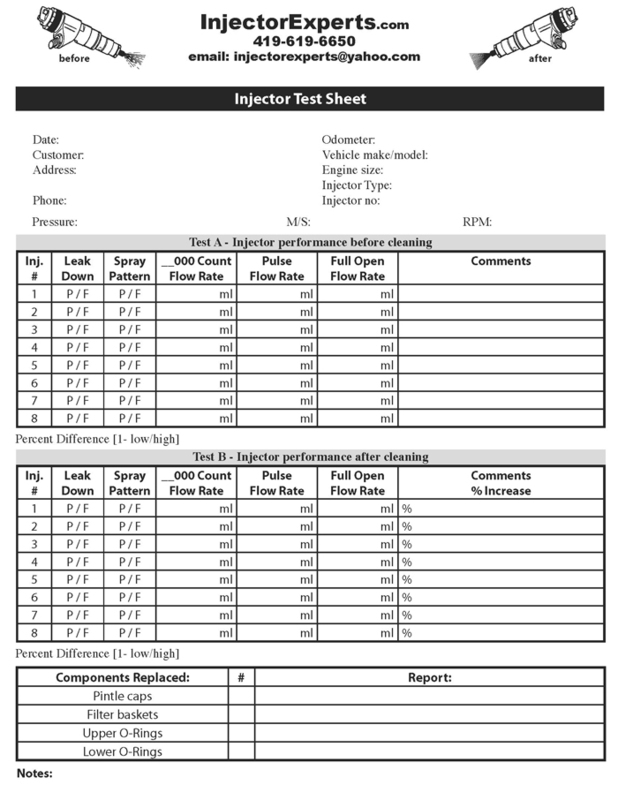 This test is a great indicator of whether the injector is functioning properly. This is a good indicator of the cleanliness and condition of the internal spring. Ideally the values are as close to one another as possible. The graph at the bottom of the test sheet is created using this information. CC/Min – This data comes from the Static Flow test and indicates the flow at the stated test pressure. Static Variance – Represents the percentage difference between the highest and lowest flowing injectors from the Static Flow test data. The lower the number the better and the normal range will be around 5% or lower. Before and after cleaning/rebuilding numbers are included. Pulsed Variance – Represents the percentage difference between the highest and lowest flowing injectors from the Pulsed Flow test data. Graph – We use the data from the Pulsed Flow test to generate the graph which makes it easy to see what is going on with your fuel injectors.